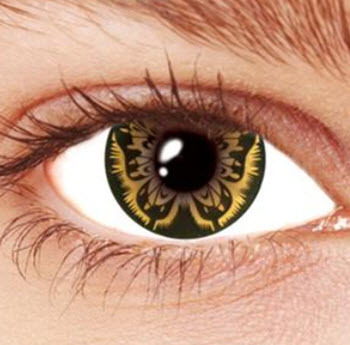 Cosmetic contact lenses are lenses worn for cosmetic purposes and not to correct vision. 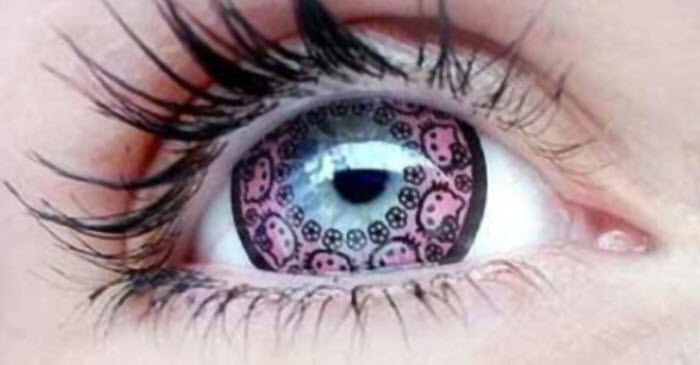 They can for instance be used to display another eye color than the wearer’s own or to create special effects such as cat-eyes, completely black eyes, and so on. These lenses can be very dangerous if not used in the correct way. 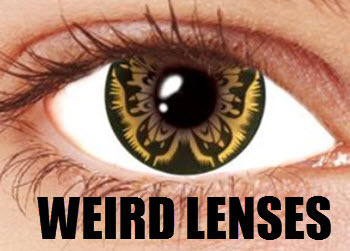 They can also be very dangerous if you buy low quality lenses. You can read more about the risks here. Of course, if you need visual correction, there are contact lenses available that will provide both correction and the desired cosmetic effect. If you don’t need visual correction, the cosmetic contact lenses that you buy should be plano contact lenses, i.e. non-corrective contact lenses. Why wear cosmetic contact lenses? There are a lot of people who want to display another natural eye color than their own. They have blue eyes but want to have hazel eyes, they have brown eyes but want to have green eyes, and so on. This group tend to opt for natural-looking CL:s that looks very similar to a natural iris and where the pupil is normal both in size and shape. Within this group, we find a lot of people how wear their cosmetic lenses every day. There are cosmetic CL:s available that will help enhance your natural eye color rather than give you a completely new one. A person with pale blue eyes can for instance use CL:s to make the blue color more strong and vibrant. Cosmetic CL:s makes it possible to display eye colors that aren’t natural for a human, e.g. a red iris. They also make it possible to have a solid-colored iris, as opposed to a natural iris which tend to display various patterns and color shades. Cosmetic CL:s can be used to hide scars, marks and other eye imperfections. There is an abundance of special-effect CL:s that will display various patterns and color combinations. You can display the Norwegian flag on your eyes when celebrating May 17, or give yourself cat-eye pupils when you dress up as cat-woman for Halloween. Some special-effects CL:s are sclerical CL:s, which means that they cover both the iris and the white of the eye, which gives you even more freedom to play with your look. You can for instance go for the daemon look with completely black eyes where no iris or white is visible. Most people who use special-effects CL:s only wear the CL:s for special occasions, e.g. for the Halloween party. A contact lens prescription from an optician or other qualified eye care professional is strongly recommended even for plano (non-corrective) cosmetic contact lenses. In some countries, such as the United States, it is even required by law. Once you have a prescription from an optician or other qualified eye care professional you can use a price comparison website such as lensshopper.com, moneysavingexpert.com, linser.com and other websites. 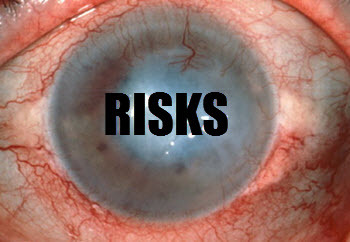 A contact lens need to be properly fitted. Your optician will check your eye and give you information that will help you buy a contact lens that fits that specific eye, e.g. when it comes to curvature. 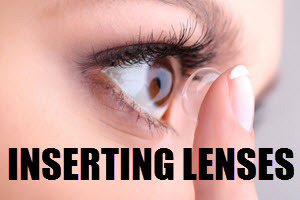 Wearing a contact lens that doesn’t fit properly can cause anything from mild irritation to serious eye problems – even if you don’t notice at first that the lens is a bad fit. Another reason why you should get a prescription is that during the eye exam, the optician will check the health of your eye. There are certain conditions associated with contact lens wear that can be detected at an early stage during an eye exam, long before you yourself will notice that anything is wrong. Finding out while the problem is still small means that you can prevent it from becoming bigger. This is why all contact lens wearers are recommended to have their eyes checked by a qualified eye professional at least once a year. This is true even if you only wear contact lenses once in a while.